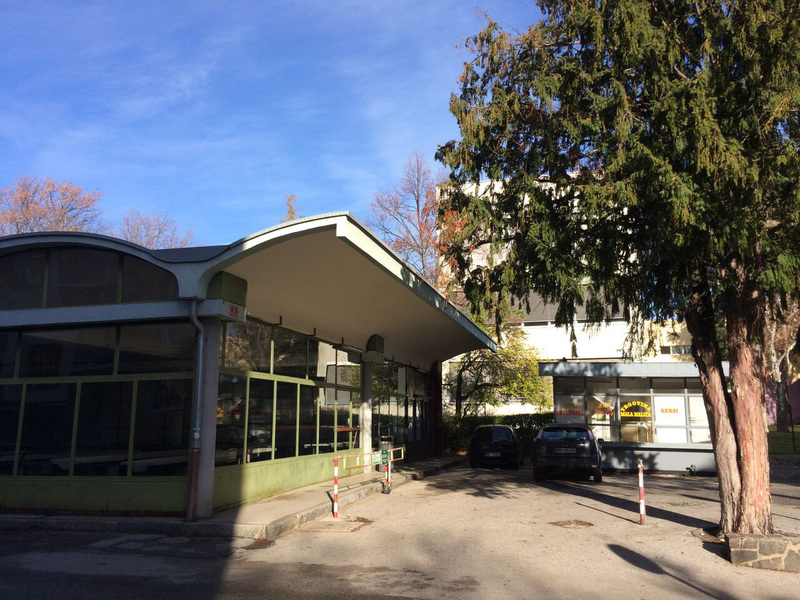 In the 1990s when businesses all around Maribor started to go bankrupt, this market place also went into decline. Even though it is still quite lonely during weekdays, it comes alive on weekends, thanks to the “Spring Saturdays” initiative. 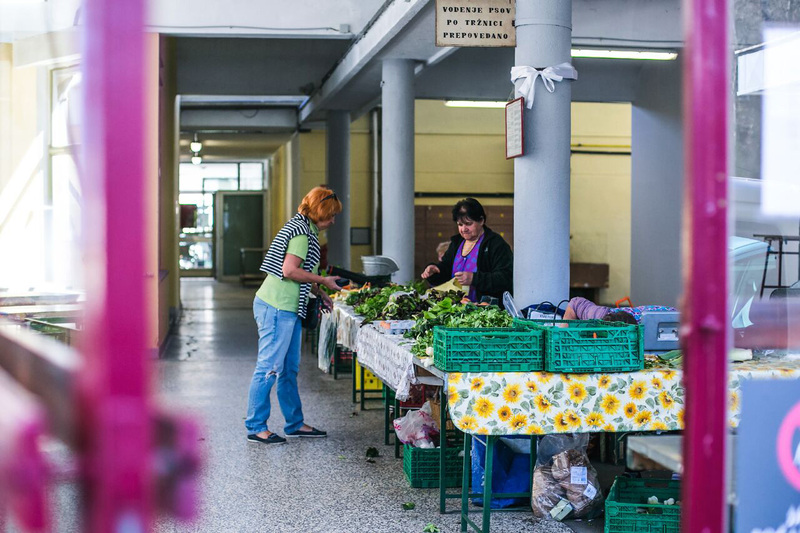 “A digital weighing scale has no place in the marketplace!” Those were the words of one lady who has spent four decades keeping Mala tržnica (Little Market) vital by selling home-grown produce. In other words, the marketplace is about adjustment and approximation, not exact measurements. She only trusts in her antique looking companion, the Roberval weighing balance, which rounds the weight up and down to half a kilo. Some impatient customers rolled their eyes but rarely complained, openly, when faced with such a nonchalant manner. Others, the trusting ones, often left the marketplace with their goods under weighed, benefiting from the scale’s inaccuracy and a generous merchant. By the time the majority of merchants had abandoned the market, the lady continued to appear at the exact same stall that her grandparents had rented forty years ago. She surely knows best that a marketplace is constructed on proximities that can’t be measured: hand-to-hand, face-to-face, goods for goods. And should this togetherness diminish, the deconstruction will take over. The lost interest in personal exchanges at Mala tržnica reflects the extinction of Maribor’s industry and the epidemic of sprawling malls/supermarkets that spread all over the city in the 1990s. As a result, the 1960s propeller of urbanisation of Maribor’s western outskirts, Mala tržnica, gradually became estranged. It is not that the Mala tržnica ever grew old; rather, the cult of community was itself outgrown by the promise of individualism. We can speculate that the impersonal/infinite/indulgent shopping experience under neon lights was just more seductive than the chaotic, rudimentary trade conditions of the marketplace. The Mala tržnica certainly suffered in globalisation’s aftermath, which has nothing with the evolution of commerce activities. The focus of the entire mega-scale shopping enterprise is the creation of detached individuals by appealing only to their needs, which turn out to be profitable for large brands. And as we learned from the lady merchant, the archetypal marketplace does not run on detachment; it runs on inclusion, communication and community. 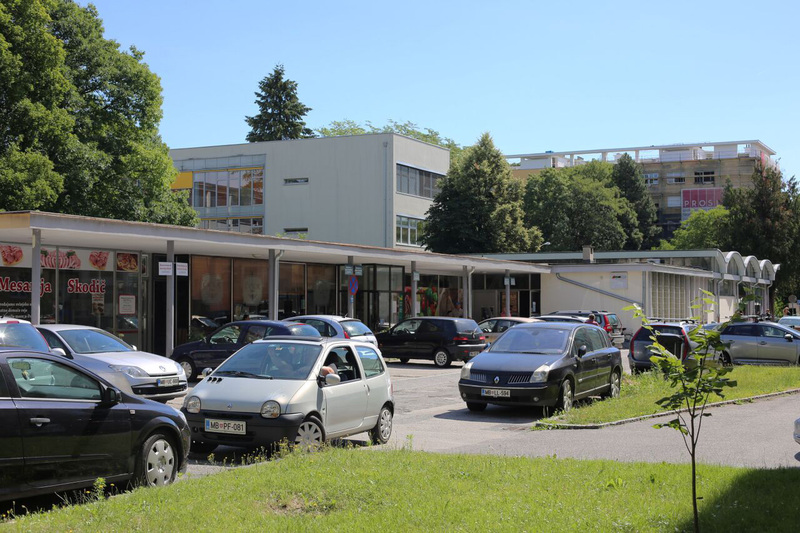 The territory of what would later become Mala tržnica was occupied by a community long before it was roofed over by Vlado Emeršič, building in 1958. At first, there was an open market, operating from a field under parasols and trees at the foot of the slopes of Kalvarija, Maribor’s vineyard hill. 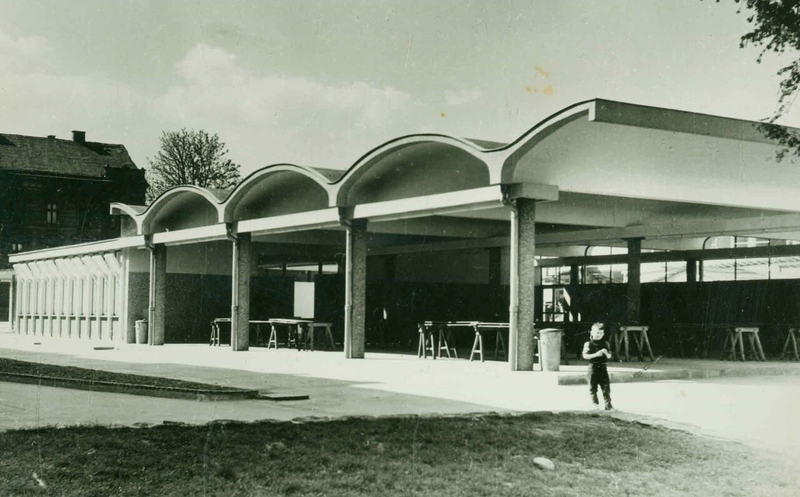 Then the market area was covered by an arched roof, extending the outdoor exchange area. The brand new building, which was impatiently awaited by neighbourhood’s children, also hosted a fish shop, butchery, bakery and a bar. 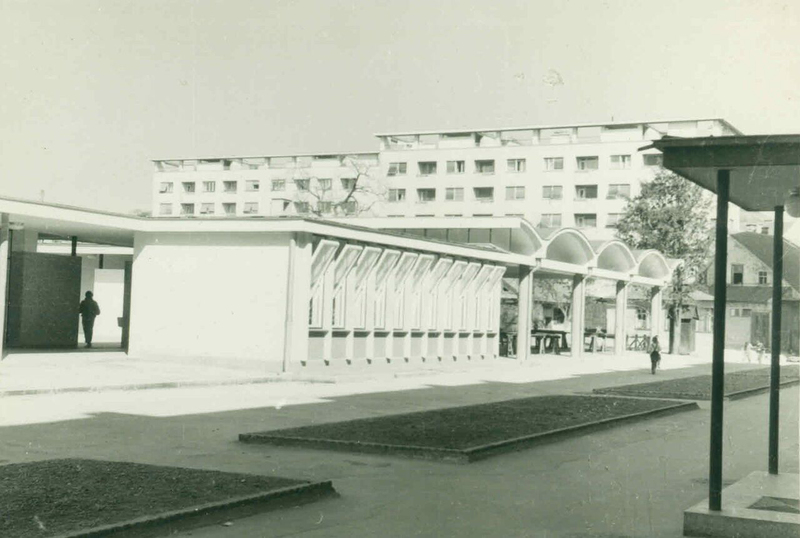 The building of a primary school (1960) accompanied the marketplace shortly after it was built. The colony of socialistic blocks erected at about the same time finally enclosed the marketplace from all sides. While the central area of the marketplace was still open, pigeons took the leading role in interrupting trade. 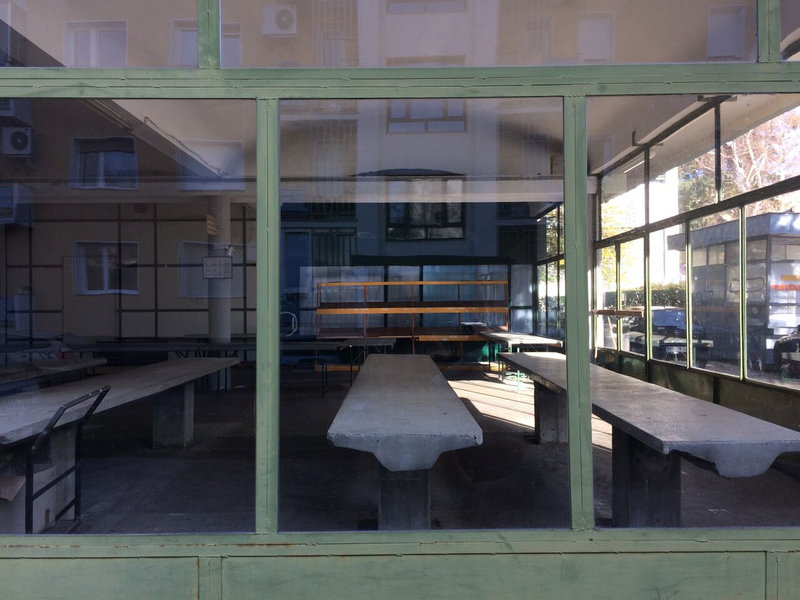 Finally, the area was closed off by simple plastic windows somewhat at odds with the original windows that rotate elegantly around the horizontal axis. 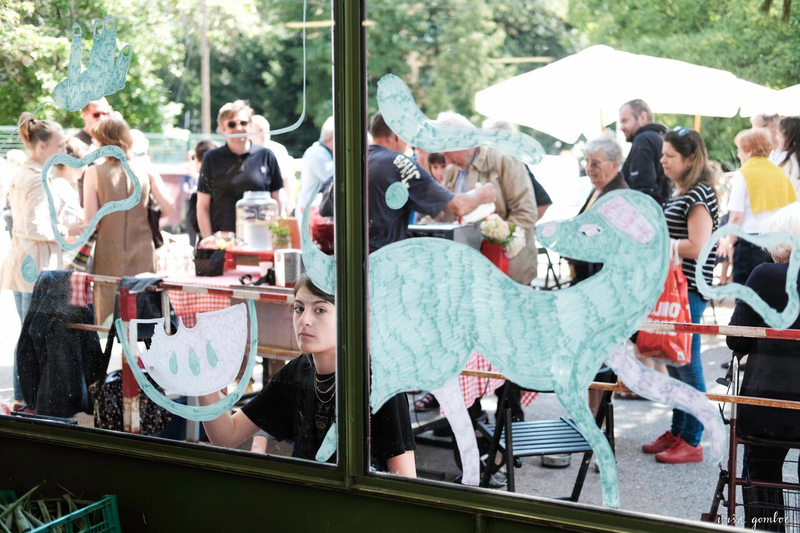 Overseen by the Municipality of Maribor for many years, Mala tržnica is now (Spring of 2018) filled with the pleasant hubbub of touching-smelling-grabbing-persuading and the exchange of goods and narratives. And this is all due to the power of individual initiative; Pavlina Japelj, an activist and a communicologist, rejuvenated the area out of sheer enthusiasm shaped by a belief that common spaces are built upon people. For a few “Spring Saturdays”, it was a place where one is never alone; one is in a constant interaction. It is a nonument to resurrected dense urban activity that went beyond its basic function and has since become a direct contributor to the city’s social and urban fabric. * Altough this is the official name, it is not correct, since the market actually stands on the corner of Dominkuševa and Kersnikova streets. DS: When it started it was full of everything? DS: Do you rembember when was that? DS: When did this start? MK: Hmm, after the seventies, eighties ... Really, it was wonderful, and we started to miss it. Suddenly, there were only two, three sellers left ... It was actually when the big dealers started to appear. First Mercator and then the others. You could get stuff cheaper there, quality wasn't that important, so the produce wasn't selling that well here. And this had a great effect. Now, the people are returning again and I hope this market place will become livelier again. DS: What about some of your memories? This wasn't only a place for buying, but also a meeting place, right? DS: So, first there was the block and then the Little Market? MK: No ... when I arrived here in 1960, the market was already here. MK: ... to get here. And this is happening, you know ... Because this is such a beautiful place. And a nice ambiance. It's a must! DS: That it becomes lively again? MK: And this is actually in the centre of the city. DS: I think that Maribor needs another market place, too. MK: And that's our Little Market! MK: Yes, but from the beginning it had the name Little Market. DS: Why do you think that was? MK: Because of the Central Market. Because there was nothing else, but the Central Market on Vodnik square and our Little Market. And this one was full of people and stocked the whole neighbourhood ... all the blocks around here. MK: I'd be very happy to see this again. DS: What do you think about the Little Market and everything that's going on here? J: I like it a lot. DS: Why do you like it? J: It's so nice that it's lively and you're never bored when you come here. DS: Do you live here nearby? J: Yes, on Maister Street. DS: And during the weekdays... it's not that lively, right? J: No, it's not that lively. DS: Have you met someone nice here? DS: What do you usually do when you come here? J: Yes, in the confectionery. DS: Are the cakes good? DS: OK ... and what does market place represent to you, generally? J: Hmmm, it is beautiful, the space... It's a market place. DS: And what's going on there? J: Hmmm... they sell stuff there... and... I like it a lot. DS: That's nice, thank you. From February to June 2018 we've organised several events that I've initiated. It started when I called a meeting of the local residents to map the problems and, most importantly, think about the solutions. Then, in April, we've organised a cleaning work action of the market and the surroundings... and it was very succesfull. From the start of the Spring I've organised, with the help of some of the very active local residents, some of the so-called Lively Saturdays when we tried to add some content and sellers to the existing offer at the Little Market. At the same time, we wanted to invite as many people as possible from the area and from further away. 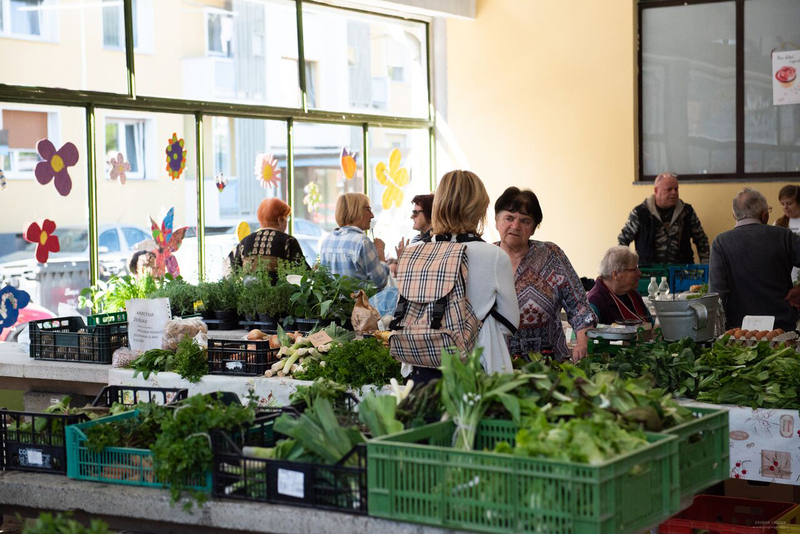 The purpose of Lively Saturdays is to remind people of the Little Market, not only residents of the neighbourhood, but also costermongers, and other Maribor residents. We've put quite a lot of effort in it... In April it was very difficult to attract sellers... But in the end of June we've already got some offers. 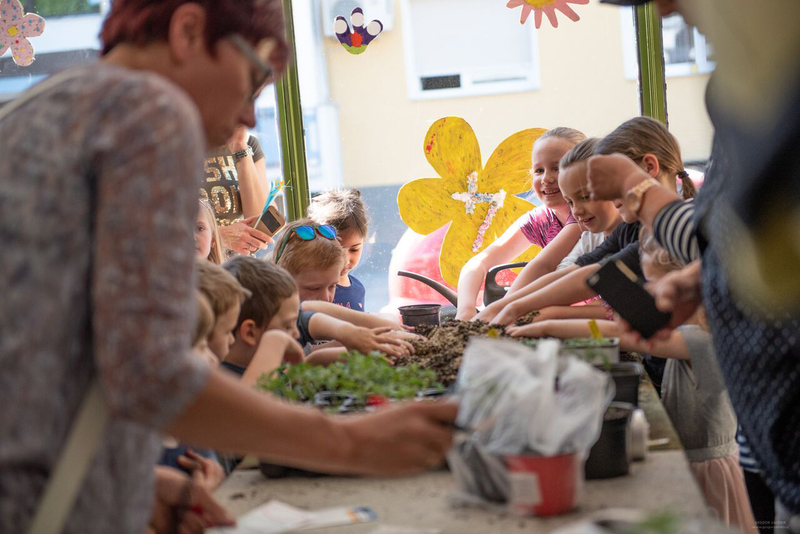 For example, one of the more interesting ones is an initiative by a resident of Dominkuš Street nearby, who wanted to arrange a small beehive on the roof of the building. I hope we will make it happen in Autumn. For now I am happy that we've attracted past costumers, as well as the regulars, and also the newcomers, like young families who didn't even know about the market place before, or didn't have any attitude towards it. They were meeting here, the children played... The reactions were very nice, and this is, in my opinion, the most important thing. I was also happy that the consumers' habits didn't change that much after all, and that the ritual of visiting th emarket place is still present in the community. The lonely Little Market in 2015. During the week only a few local growers sell their produce at the Little Market.